These Guidelines set out best practice to reduce the cost of your boards and to minimize the risk of errors arising during manufacture. 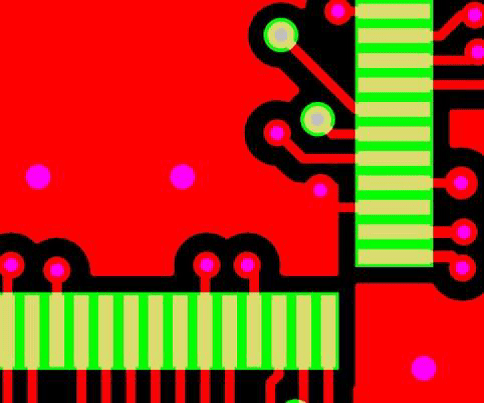 Not all possible PCB design features are available on all our services. Look at our services overview to see more details. On some specific features we highlight the availability in a particular service.The world is divided into a part that works with the Metric system and a part that works with the Imperial system for defining measurements. The “µm” is 25.4 times smaller than the “Mil”. Dimensions for electronics are driven smaller all the time. To ensure the highest quality possible, we decided many years ago to work exclusively in the Metric system in our front end department. Therefore the basis of all measurements given in this document and in our website is the Metric system. All Imperial values are there for clarification and general understanding only. There is no general consensus throughout the global PCB industry on terminology, so if we feel any term we use may be unclear we have tried to explain it when it first appears. Gerber version 2 (or Gerber X2) or Gerber version 1 (or Geber X1). All Gerber specifications from Ucamco NV owner of the format. Artwork means all copper layers, soldermask and legend layers, board outline or mechanical layer, SMD paste layers,carbon layers, peel-off layers, etc. DPF (only true drill data, not a drill map). Please supply ONLY ASCII-encoded files. These files are man-readable so that our engineers can check them visually if needed during data preparation. So we don’t accept formats such as EIA or EBCDIC. We prefer Gerber X2. 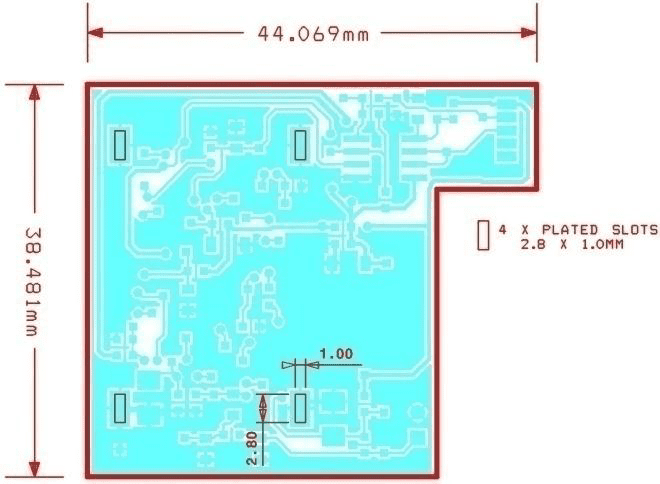 We do not accept native CAD PCB design data other than from EAGLE or KiCAD. 2. 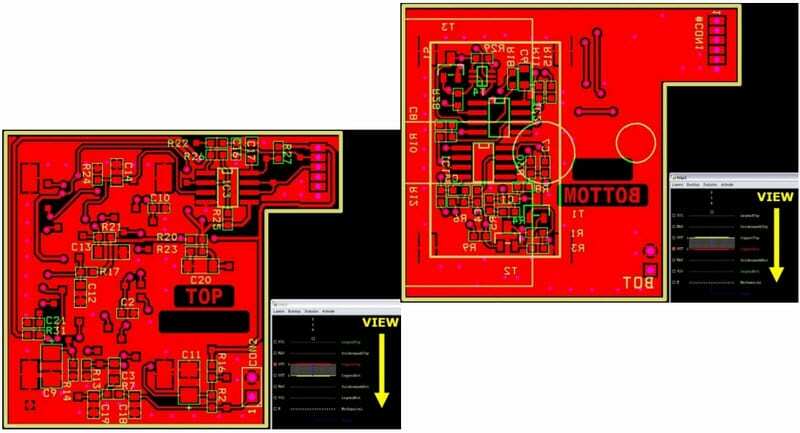 It is impossible to have legal copies of every CAD PCB design package in the market and to have the necessary knowledge to use them all correctly. As designers do not all use the same software version, we would need to have a whole range of update patches as well. Gerber is clear and unambiguous. It has been the industry-standard format for PCB manufacture for many years. Every PCB design package can output Gerber data and the process will be fully described in your CAD PCB design package handbook or help-files. You can check the accuracy of the Gerber output data by downloading one of the many free Gerber viewers available on the internet. We recommend GC-Prevue available as freeware from www.graphicode.com. 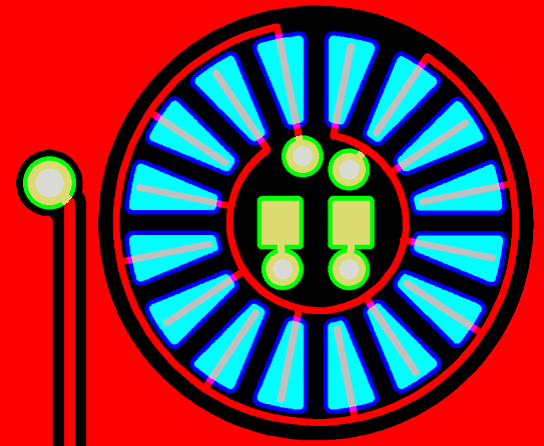 PCB Visualizer: For reasons of automated analysis and visualisation, the PCB Visualizer only accepts Extended Gerbers X and X2 or an EAGLE .BRD file or a KiCAD file. Gerber files for the copper layers, soldermask and legend layers, mechanical layer and SMD paste layers. Plus carbon, peel-off and via-fill layers as needed. Excellon drill file(s) for drilling. If you want us to prepare a customer panel (“array”, “matrix” or “biscuit”) from the single board data to your individual specification, the panel plan can be supplied as a Gerber or DPF file. Please DO NOT provide any additional files such as original CAD data (other than Eagle or KiCAD), Graphicode GWK files, PDF files, Word files (doc), Excel files (xls), etc. Where possible check your generated output data (Gerber & Excellon files) either using PCB Visualizer or with a Gerber viewer before you send it on to production. Make sure that all instructions or other necessary input needed for making the boards are included in the Gerber and Excellon files. 3. Use clear and easy to understand file naming and try to avoid long filenames. Make sure that we can easy determine the layer function from the filename. 4. DO NOT scale your data. All data provided must be scale 1/1 (100%). 5. Make sure that your Gerber files DO NOT contain apertures with a zero-size (size = 0.00mm or inches) and that your Excellon data DOES NOT have zero-sized tools (size=0.00mm or inches). 6. Use the same offset for all your Gerber layers and the Excellon drill data. Preferably use no offset at all. 7. Use the same units (mm or inch) in your Gerber & Excellon output files as in your CAD PCB design software. This will eliminate conversion or rounding errors. 8. Use the same resolution (grid) for your Gerber & Excellon data to allow a perfect match. Set the resolution (grid) for output (Gerber & Excellon) to 6 decimals using the imperial system and 5 to decimals using the metric system as recommended in the Gerber specification. If your CAD system supports only lower resolutions than what is recommended then use the highest available number of decimals. 9. Make sure that your data is supplied as seen from top to bottom through the PCB. DO NOT mirror (or reflect) any data layer – image or drill. Viewing a PCB from top to bottom through the board is the universal practice in the PCB industry. We view and handle your data in that way, as does your CAD PCB design software. This means that when viewing your Gerber data, text on the top side of your board (copper, soldermask, legend) should be readable and text on the bottom side (copper, soldermask, legend) should be non-readable (= mirrored). 10. Put some small text (board identification, company name, etc…) in the copper layers. Make sure the text complies with the readability rules. This will help us to avoid mirroring errors. 11. RECOMMENDATION. In your Gerber files use flashed pads as often as possible. 12. RECOMMENDATION. In your CAD PCB design software try to create an aperture list for Gerber output which only shows the apertures used in the design. 13. Make sure that you include the board outline on all layers. This will enable us to properly align all layers in case of an offset problem. Also include the board outline in a separate Gerber mechanical plan. 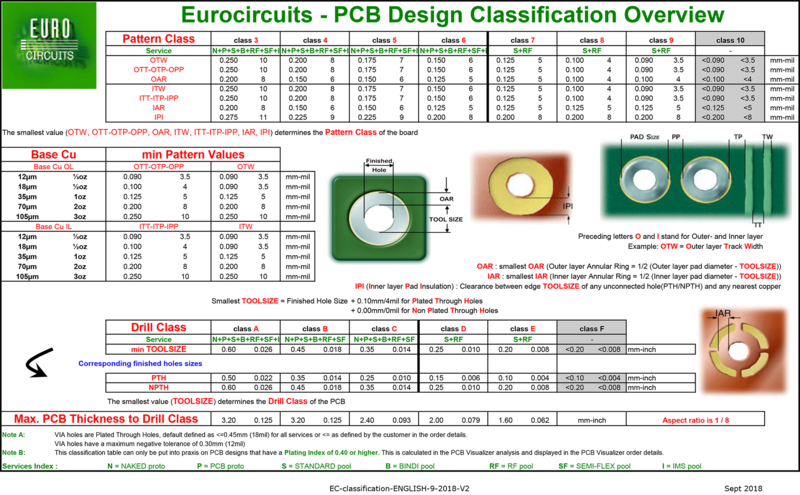 We use “pattern classes” and “drill classes” as convenient shorthand to measure the manufacturability of the PCB. This controls whether the board can be pooled or not and has an impact on the pricing. The smallest of these values determines the pattern class. 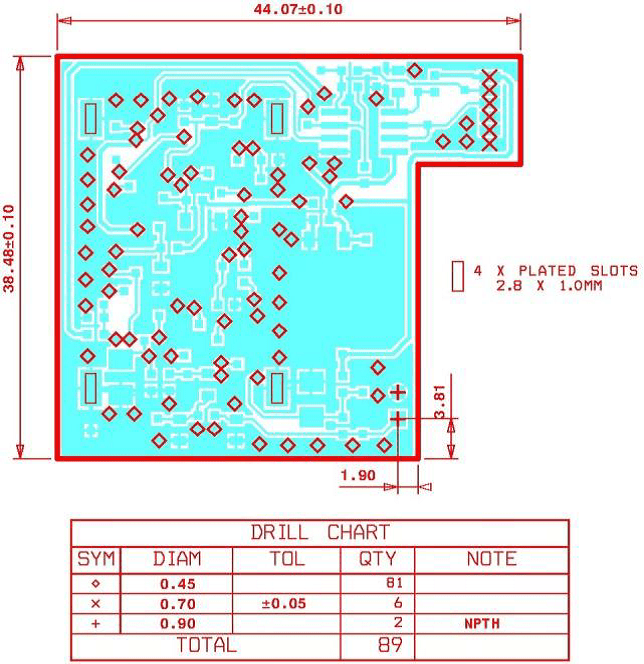 The drill class is based on the smallest production tool size on the board. For more information see the current Classification table on below. IMPORTANT: Annular Ring calculations are done from the production TOOLSIZE for the holes, not from the finished hole ENDSIZE. –> For the conversion rules for ENDSIZE to TOOLSIZE see the chapter about holes. The Classification table shows the lower limit values of any given class. 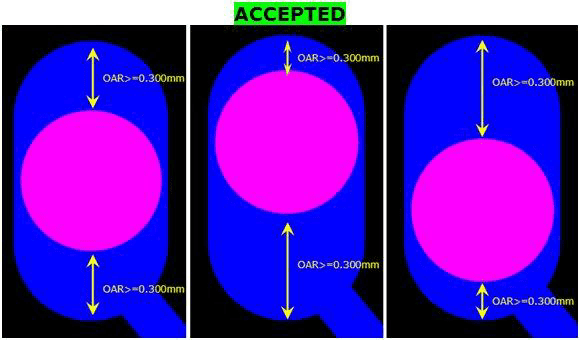 The Annular Ring values OAR and IAR in the classification table are for plated holes (PTH). For connected non-plated (NPTH) holes we recommend a minimum annular ring of 0.30mm (12mil). As NPTH holes have no plated barrel, a smaller annular ring may lift during soldering or break away even during normal operating conditions. The thickness of the starting copper foil determines the minimum pattern values that are possible. This means that the highest pattern class possible depends on the copper thicknesses. Thicker copper needs a wider isolation for reliable etching – see the Classification table. Not all copper thicknesses are available in all services. See our services overview document for guidance. 1. 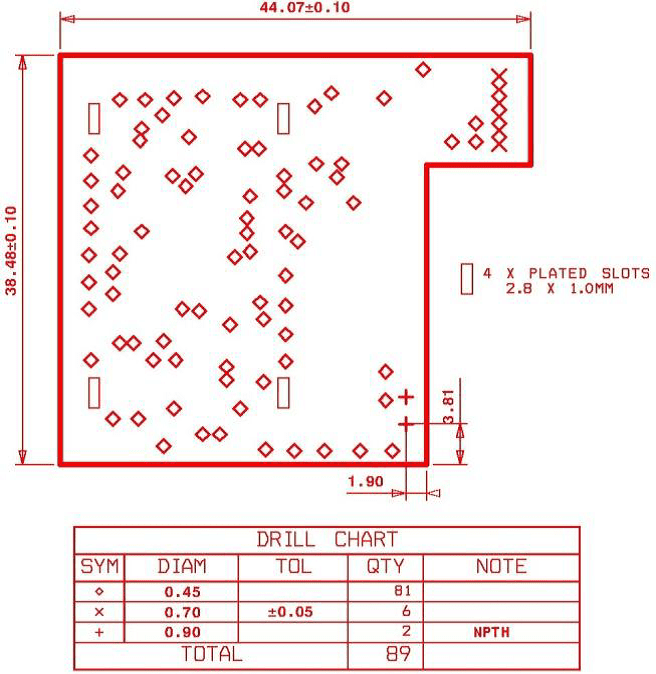 Tool lists for drill files are ALWAYS read by our CAM systems as finished hole sizes (ENDSIZE). 2. All PCB drills are manufactured in increments of 0.05 mm. So we convert the drill sizes given in the drill files or tool lists into millimeters and round to the nearest 0.05mm. Drill size of 31mil is converted to 0.7874mm and then rounded to 0.80mm. Drill size of 32mil is converted to 0.8128mm and then rounded to 0.80mm. Drill size of 33mil is converted to 0.8382mm and then rounded to 0.85mm. 3. If possible, provide separate drill files for plated (PTH) and non-plated (NPTH) holes. If this is not possible, always specify different tools for PTH and NPTH holes and mark clearly which tools are PTH and which tools are NPTH. For 0-layer and 1-layer boards: ALL holes are considered as NPTH by default. Non-connected holes without copper pads. Connected holes with a copper pad on 1 side (outer), no connection on any other layer (outer or inner) and no copper pad on the other side (outer). 5. VIA holes are Plated Through Holes, defined by default as <=0.45mm (18mil). VIA holes have a maximum negative tolerance of 0.30mm (12mil) and may be reduce to accommodate a larger annular ring when needed. If you need component holes of 0.45 mm or smaller with standard component hole tolerances, you can specify this in the order details. The standard tolerance on via hole ENDSIZE diameter. 7. Standard tolerances on drill ENDSIZE diameter. 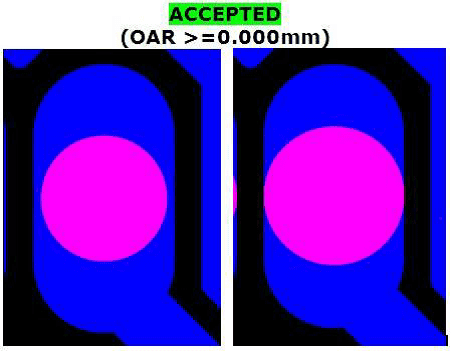 VIA holes have a maximum negative tolerance of 0.30mm (12mil). For definition of VIA holes see point5 above. When no tolerances are specified in your data, we will produce according to our standard tolerance specifications. If you require tighter tolerances these should be clearly indicated in the mechanical layer and tool list. They will increase the cost of the PCB so should not be used without a compelling reason. NPTH holes without copper pads: these NPTH holes will be treated as part of the board outline. 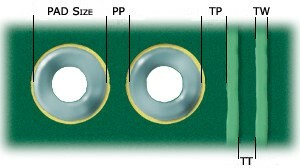 PTH holes with copper pads: these will be taken as “plated holes on the board edge” or “Contour Cut PTH drills” and should be clearly indicated in the mechanical layer. REMARK: Plated holes cutting the board edge are not available in the PCB proto service. Do not overlap drill holes. These can cause broken drill bits and the small pieces of material left behind may cause voids in the plated hole barrels. The minimum drill hole to drill hole distance is 0.25mm (10mil). This is measured edge to edge of the drill TOOLSIZE. Do not use overlapping drill holes to define slots. See section Mechanical Layer for the correct way to indicate slots and internal cut-outs. 10. Annular Rings on oblong pads. The rules for annular rings on oblong pads are NOT different from round pads, but we allow some exceptions to the rules. MUST ALWAYS FULLY COMPLY with the standard Annular Ring rules for any given pattern class. The measurements below are taken from the production TOOLSIZE. The hole may not be positioned in such a way that it could disconnect the pad from the track. 2. Avoid filling large copper areas or copper planes with small draws (“painting”). Where possible, use contours or polygons to construct areas or planes. Contourized areas or Polygon Area fill are standard features in Extended Gerber output (RS-274X). 3. When generating output include the board outline in your copper layers. This is best done using a small line – e.g. 0.50mm (20mil) wide – where the center of the line is the exact board outline. We will remove this line during the making of the production tools. 4. Remove copper pads from NPTH holes if these pads are not used or connected to other copper. 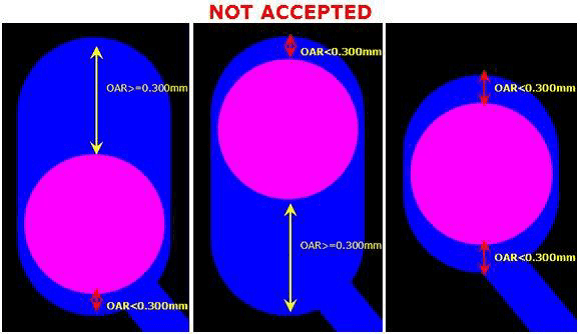 If you require copper pads on NPTH holes then it is advisable to use a minimum Outer Annular Ring (OAR) of 0.30mm (12mil) – see Classification point 2. 5. Check your final design for small areas of unconnected copper or narrow copper webs and slivers which can lead to problems in production. X: Must meet classification criterion for minimum Track Width (TW). 6. Minimal clearance between edge of board and pattern. 7. If you require a copper area or plane to extend up to the board edge, then clearly indicate this in the mechanical layer. 1. There is a risk of a rough board edge as the copper may tear during contour routing (profiling). 2. 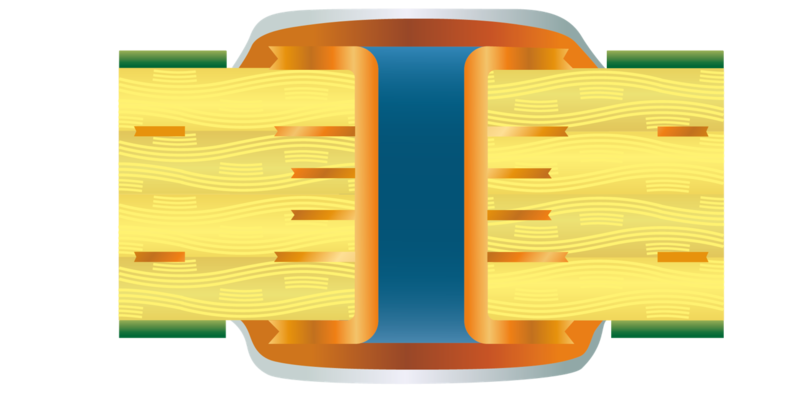 The copper can create electrical shorts between layers. 3. Copper up to the board edge is NOT compatible with scoring (V-cut). 8. If you require the board edge or part of it to be plated, then clearly indicate this in the mechanical layer. In addition, were the board edge is to be plate there must be copper placed on the top and bottom layers with a minimum width of 0.5mm from the edge of the board inwards. 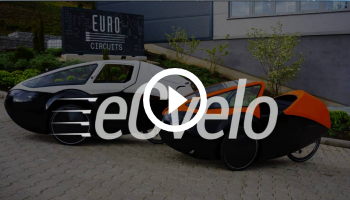 This requirement is needed to be able to produce the Round Edge Plating in such a way that the metallisation is physically strong enough to stay attached to the side of the board. 9. Any text placed in a copper layer has to comply with the design rules for the given class (see classification table). All copper text must be correctly readable. 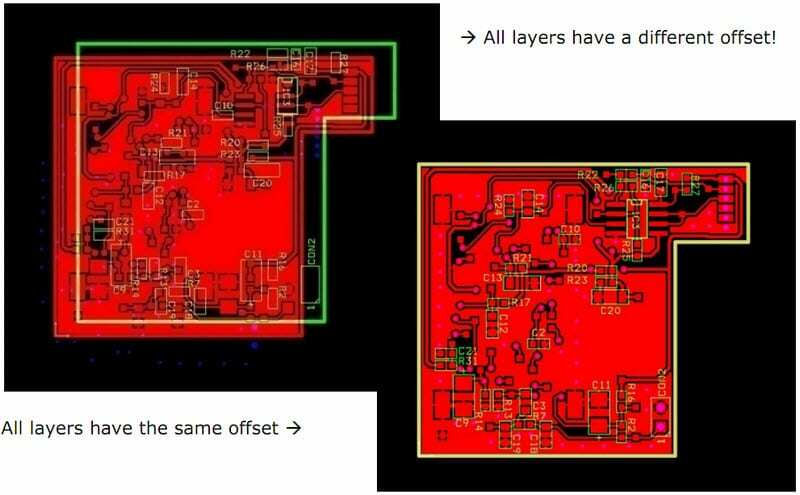 As a PCB is always viewed from top to bottom through the PCB, text on the top layer of your board should be readable and text on the bottom layer should be non-readable or mirrored. “Peelables” occur during production and are small/narrow pieces of photo resist enclosed by pads, traces and/or planes which may “peel” away during processing and cause short or open circuits. All copper even within the same net must comply with the design rules for the given class (see classification table). 11. 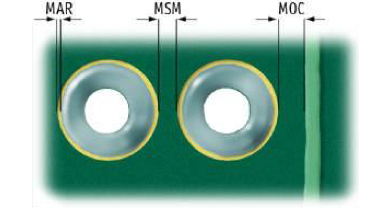 For gold connectors do not place any plated holes (PTH), SMD or other pads closer than 2.00mm (80mil) to the gold fingers – see drawing. 12. ALWAYS provide the proper layer sequence for a multilayer board. Indicate the layer numbers in the copper image by placing a logical number in each layer (1 for top layer, 2 for inner1, 3 for inner2, etc….). Make sure the numbers are positioned in such a way that they do not overlap, and can be seen through the complete PCB. Name each layer file in a way which indicates clearly the sequence to be used (e.g. T(op), I(nner)1, I(nner)2, B(ottom). Include in your Gerber mechanical layer a clear build-up drawing including all copper layers, soldermask and legend layers, additional layers like peel-off or carbon in the correct sequence and with the correct corresponding data file name. Include a simple ASCII text file with your data indicating which file is to be used for which layer, preferably already in the correct build-up sequence (this is the least preferred solution: it is better if the build-up is indicated in the Gerber data as in the previous 3 suggestions). 13. RECOMMENDATION. 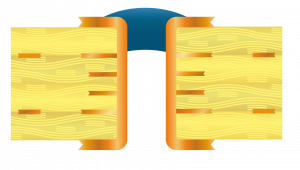 If holes on inner layers are not connected on a particular layer, do not give them a pad in the inner layers. In any case we will remove all unconnected pads on the inner layers. 14. Thermal definition: make sure your thermal relief pads are properly defined and comply with the chosen pattern classification for Annular Rings (AR), Track Widths (Thermal Segment Width) and Gaps. 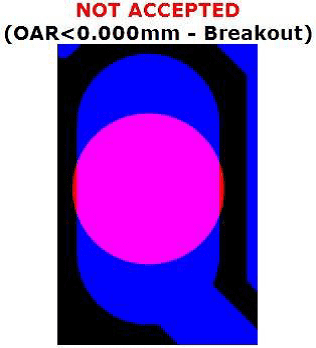 Good practice for Thermals is to work with a Gap of 0.20mm (8mil) and a Thermal Segment Width of 0.20mm (8mil). 15. Hatching patterns. RECOMMENDATION: use full copper rather than hatching patterns in copper planes. Any hatching pattern that DOES NOT meet these minimum requirements will be converted into a full copper plane. Designers sometimes ask us for some guidelines on BGAs. Independent of particular components you need to consider what size of pads you need to use and how many connections you need to bring out of the package. You should compare this with our current Classification table. 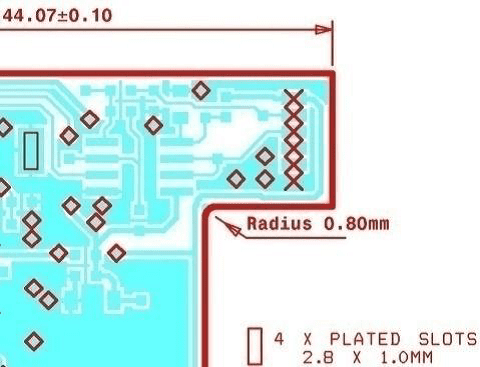 Using only poolable options, you need to bear in mind that the minimum track to track and track to pad isolation is 0.100mm (4mil), the minimum track width is 0.100mm (4mil) and the smallest finished hole size is 0.15mm (6mil) if you want vias under the device. For a 0.15mm (6mil) finished hole size the smallest pad we need for a good annular ring is 0.450mm (18mil) on outer layers and 0.500mm (20mil) on inner layers. 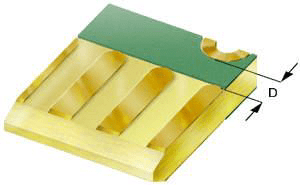 Making your board non-poolable, you can reduce the minimum track width and isolation to 0.090mm (3.5mil), the minimum hole size to 0.10mm (4mil) with a minimum pad size of 0.400mm (16mil) on outer layers and 0.450mm (18mil) on inner layers. This will increase the price. 1. RECOMMENDATION: ALWAYS include a Gerber mechanical layer in your data set. A proper mechanical layer is VITAL to a good and flawless production of the PCB as it should provide us with all the needed mechanical information for the construction of your PCB. 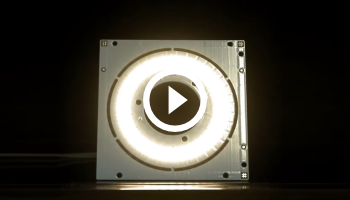 In case of cut-outs or slots in your PCB, this layer is essential to the production! 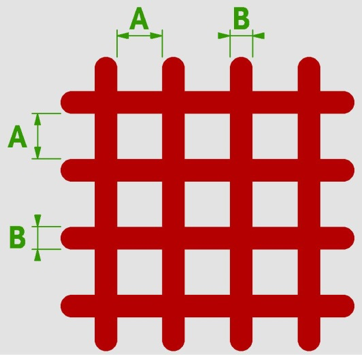 DO NOT scale your mechanical layer, it should be 1 to 1 and reflect the exact dimensions of the PCB. 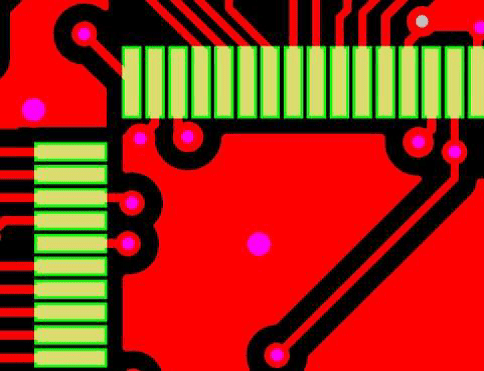 The mechanical layer is – as for all layers – also viewed from top to bottom through your PCB, so do not mirror the mechanical layer. 2. Do not provide actual routing layers for board contours or inside milling. Routing data is production-specific depending on the rout tools, tool compensations, routing order and direction used by each PCB fabricator. This means that we cannot use customer-provided routing layers. We need to completely rework them, which can lead to confusion and misinterpretations which may result in incorrect boards. 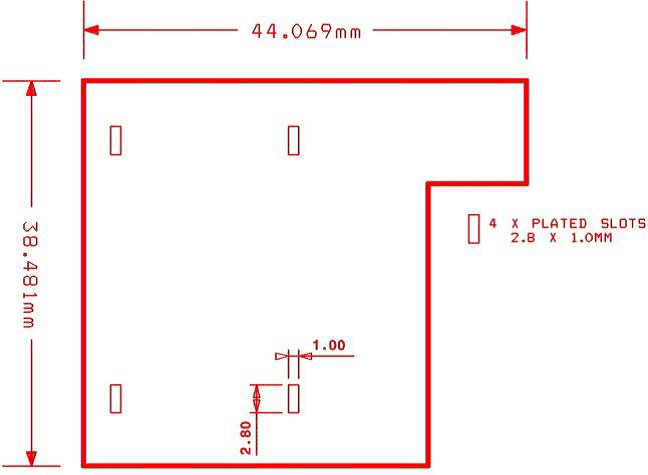 The exact board outlines, ideally including dimensions (mm or inch). Exact positions and sizes for all inside milling, slots or cutouts, ideally including dimensions (mm or inch). 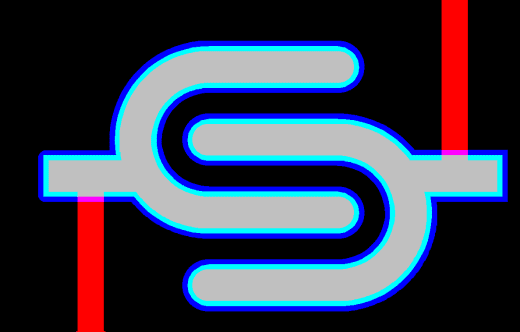 Outlines are best shown using a small line – e.g. 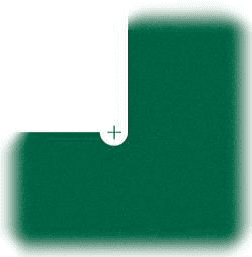 0.50mm (20mil) wide – where the center of the line represents the exact board outline. When no dimensions are given we will always take the center of the contour lines to be the exact outline of the board, regardless of their thickness. 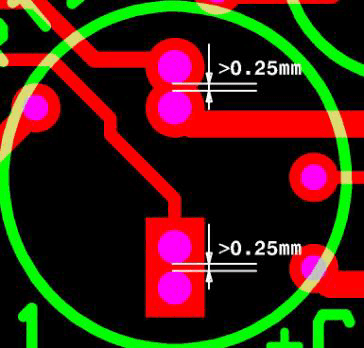 A reference hole: the distance from one drill hole in X and Y to the PCB outline. This is particularly important when you only have NPTH holes without copper pads. Positional indication of all drills using symbols (=drill map). Use different symbols for each different drill size. A clear layer sequence or buildup drawing including all copper layers, soldermask and legend layers, any additional layers like peel-off or carbon, in the correct sequence viewed from top to bottom and with the correct corresponding data file name. 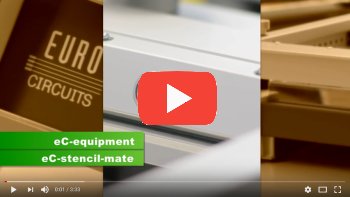 Special build-up: If the build of your PCB requires material thicknesses, copper thicknesses or multilayer buildups which are different from our standard values then add this information to the layer sequence or buildup drawing. We ONLY use a drill map to cross-check the Excellon drill file(s) for correctness. A drill map will NEVER be used to generate a drill file as this gives too many opportunities for error. 5. The standard tool size used for all outline routing is 2.00mm (79mil). This means that the standard minimum radius for inside corners is 1.00mm (39.5mil). Requirements for a smaller radius on inner corners should be clearly indicated in the mechanical layer. A sharp or 90 degrees inner corner can be obtained by placing a properly sized NPTH drill exactly on the board outline center of the inner corner or by a clever design of your board outline. 6. The smallest width for any routed slot is 0.50mm (20mil) ENDSIZE. If no tolerances are specified in your data, we will produce according to our standard tolerance specifications. The purpose of Soldermask is to provide a protective coating on the PCB against contamination, oxidisation, humidity, mechanical damage and electrical shorts. The application of Soldermask requires certain criteria to ensure that it has good adhesion, quality and reliability and the PCB layout has a major influence in this. The data output from a CAD system for Soldermask is usually negative, what this means is that only the Soldermask openings are output (usually as pads), this is inherited from the days before laser plotters or DI. 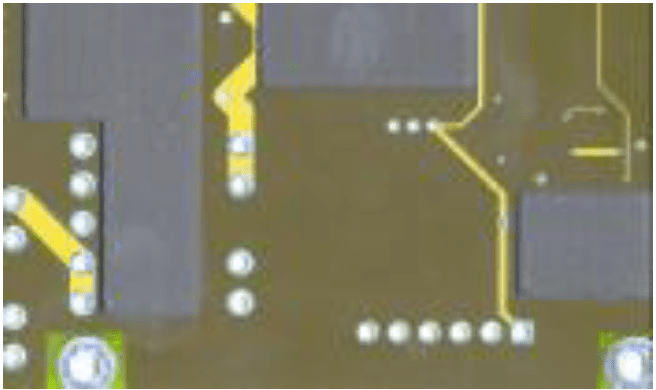 As the Soldermask opening is usually larger than the copper pads it is advisable to consider the following points during the layout of the PCB. Allow sufficient isolation between copper pads if a Soldermask web/segment is required between them. See Pad-to-Pad (PP) in the tables below. Allow sufficient isolation between tracks/plans and copper pads to ensure they are fully covered by Soldermask. See Track-to-Pad (TP) in the tables below. The values below are the minimum required to achieve a good and reliable Soldermask application, these are based on our production parameters and the Soldermask specification. The method of exposure used is defined by the Soldermask colour requirements. Colours available – Green, Black, Red and Blue. Smaller Mask Annular Ring (MAR). Smaller Mask SegMent (MSM) or Web. Smaller Mask Overlap Clearance (MOC). No White or Transparent Colours currently available due to high energy required. The table below contains the minimum values for DI Soldermask. * Soldermask opening shave = 0.005mm Maximum. 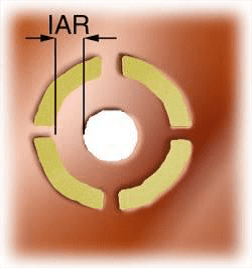 MAR (Mask Annular Ring) – the clearance between the Soldermask and the copper pad. 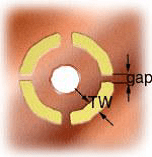 MSM (Mask SegMent) – the bridge/web of Soldermask between adjacent pads. 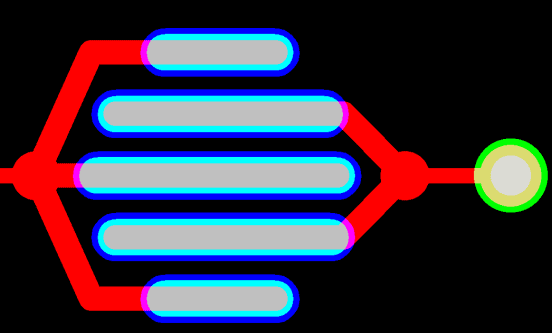 MOC (Mask Overlap Clearance) – Distance between a copper track/plane and an adjacent Soldermask opening. The table below shows the minimum Design Rule values to achieve the minimum LDI Soldermask values. 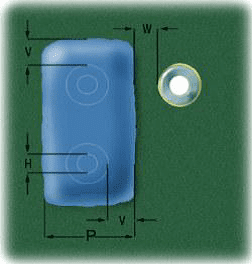 PP (Pad to Pad) – the isolation between adjacent copper pads. TP (Track to Pad) – the isolation between adjacent copper pads and tracks/plans. 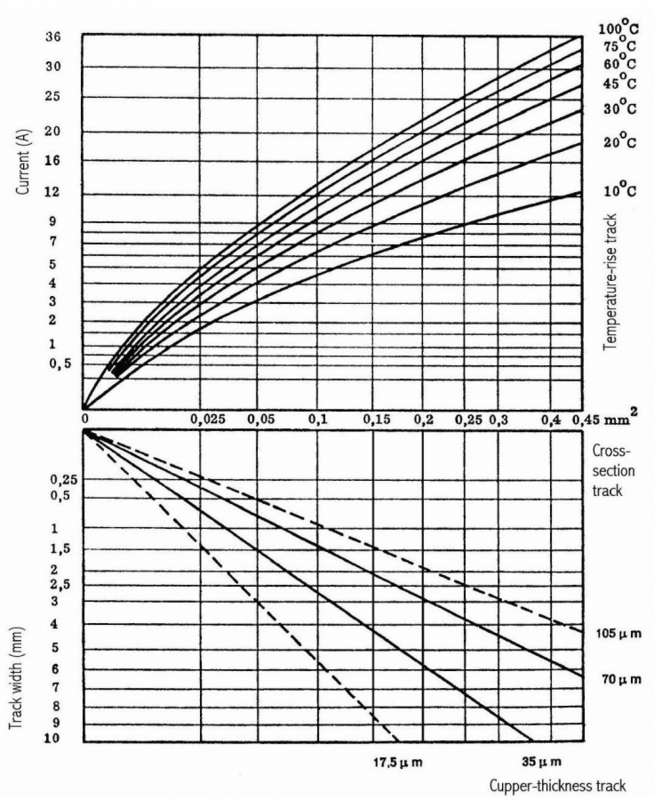 TT (Track to Track) – the isolation between adjacent copper tracks/plans. Colours available – White or Transparent. Larger Mask Annular Ring (MAR) required. Larger Mask SegMent (MSM) or Web. Larger Mask Overlap Clearance (MOC) required. The table below contains the minimum values for PI Soldermask. ** Soldermask opening shave = 0.040mm Maximum. The table below shows the minimum Design Rule values to achieve the minimum PI Soldermask values. 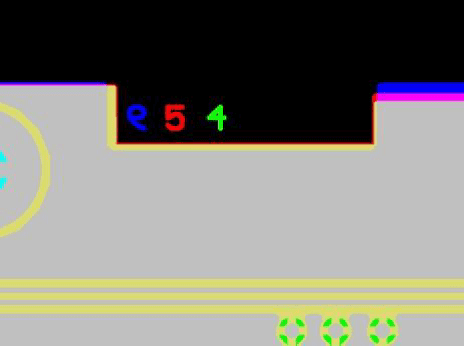 Soldermask segments less than he minimum MSM value will be removed, example below. Where the copper pad of the Via Hole is to be covered with Soldermask, it does not mean that the hole will be completely covered or closed by Soldermask. Completely covered (Tented) Via Holes can only be guaranteed if Via Filling is used (See section ViaFilling here below). If you require tented Via Holes, please make sure that you generate your Soldermask data without Soldermask pads for Via Holes. NPTH with copper pads should follow the same rules as for Plated Holes. NPTH without a copper pad will requires a Mask Annular Ring (MAR) of 0.125mm. Always include the board outline in your Soldermask data, this best done using a small line – e.g. 0.50mm wide. 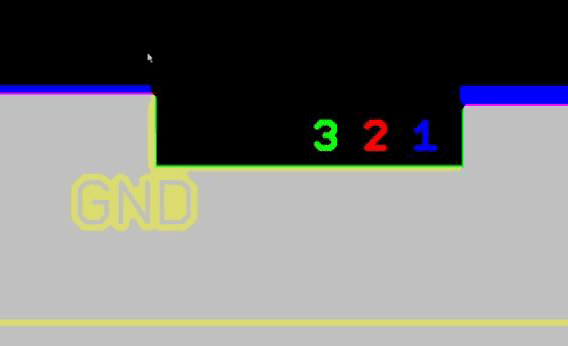 The center of the line should be exactly on the actual board outline (we will remove the line from the final production data). 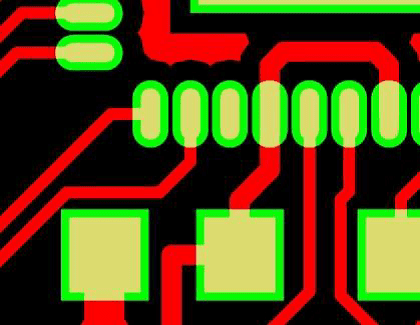 If you require board edge areas of your PCB to be free of soldermask, use a wide line to indicate the board outline. 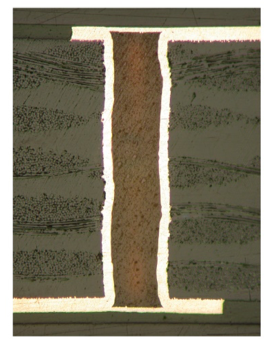 The line-width should be at least 2.00mm resulting in 1.00mm border free of Soldermask. 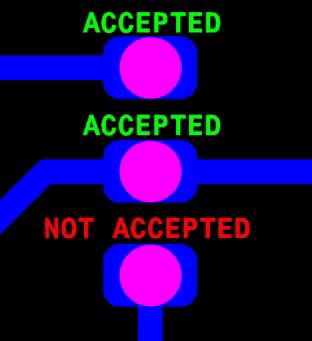 It is also advisable to indicate that you require a border free of Soldermask in the mechanical data. Minimum Text height for good readability: 1.00mm (39.5mil). 2. The Legend Print will ALWAYS be broken – or clipped – against the corresponding soldermask layer. Legend clipping clearance is 0.10mm (4mil). This means that we clip the legend 0.10mm (4mil) back from the soldermask openings. Any bits of line smaller than 0.10mm (4mil) are removed. In absence of a soldermask layer, the legend print is clipped against the corresponding copper layer. If there is no copper layer, the legend is clipped against the drill layer. To avoid your legend being clipped maintain a minimum distance of 0.20mm (8mil) between your legend elements and the copper image. This 0.20mm (8mil) = 0.10mm (4mil) Soldermask Annular Ring + 0.10mm (4mil) Legend Clipping Clearance. 3. All legend text must be correctly readable. 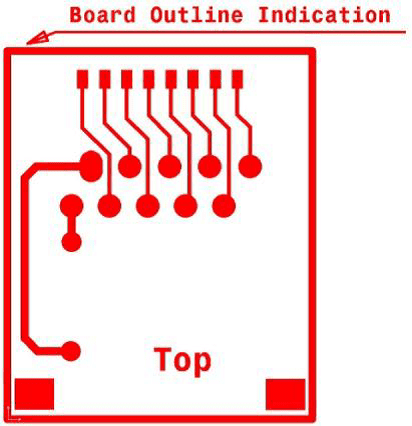 As a PCB is always viewed from top to bottom through the PCB, text on the top layer of your board should be readable and text on the bottom layer should be non-readable or mirrored. 4. Include the board outline in your legend layers output data. This is best done using a small line – e.g. 0.50mm (20mil) wide – where the center of the line is the exact board outline. This line will be removed by us from your design. In all cases we will clip away any legend text within 0.25mm (10mil) of the board edge. 5. It is NOT ADVISABLE to place a legend layer on the copper layer side of a PCB without a soldermask layer. 2. Always clearly indicate on which side of the PCB carbon is to be applied. This can be on one side or on both sides. 3. When generating output include the board outline in your carbon layer(s). This is best done using a small line – e.g. 0.50mm (20mil) wide – where the center of the line is the exact board outline. We will remove this line from the production-ready data. 5. These rules mean that you must have a minimal isolation or spacing of 0.80mm (16mil) between the copper elements of a typical carbon finger contact. Please see our Carbon-Conductive Ink Technical Data Sheets. Protect selected solder holes and pads against solder plugging during mass soldering. Protect gold-plated contacts or carbon elements during mass soldering. 2. Generally the peel-off mask is applied ONLY to 1 side of the PCB, usually the bottom side. 3. When generating output include the board outline in your peel-off layer(s). This is best done using a small line – e.g. 0.50mm (20mil) wide – where the center of the line is the exact board outline. We will remove this line from the production ready data. 5. 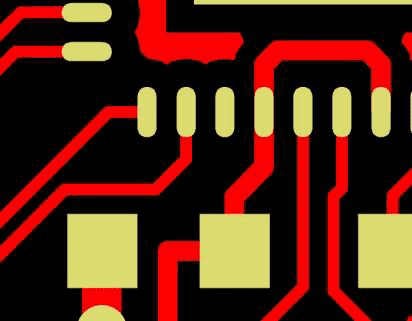 Avoid using many different small peel-off areas randomly placed on your PCB. Make the peel-off area as large as possible by connecting the separate peel-off areas wherever practical. This will make it easier to remove the peel-off after soldering. Completely closed via holes can only be guaranteed by using Via Filling. The vias to be filled are filled with a special hole plugging resin, TAIYO THP-100 DX1 thermally curable permanent hole filling material, using a dedicated machine, ITC THP 30. The extra production steps needed for Resin Via Filling are performed before the 2-layer PCB production process. In case of making multi layers, this is after pressing. After these steps the normal PCB production process starts or continues: drilling of the other PTH holes, and the normal outer layer production processes. Using the IPC-4761 via protection type classification, this Via Filling type with Resin process ALWAYS results in a “Type VII – Filled and Capped” via. Note: This Via Filling with Resin type is suitable for Via-in-Pad application. The vias to be filled are filled using Soldermask ink as hole-filler substance. This Via Filling technology uses a drilled ALU sheet to push normal Soldermask ink in the via holes to the filled. This is a screen-printing process. This is a step before the normal Soldermask process. Vias filled with soldermask always get a reverse soldermask pad added with size via-toolsize+0.10mm. In other words, this Via Filling type will always be covered with soldermask on top and bottom. Using the IPC-4761 via protection type classification, this Via Filling type with Soldermask process ALWAYS results in a “Type VIb – Filled and Covered” via. Note:This Via Filling with Soldermask type is NOT suitable for Via-in-Pad application. ONLY PTH holes can have Via Filling (PTH hole = hole with copper pad on TOP and BOT side). 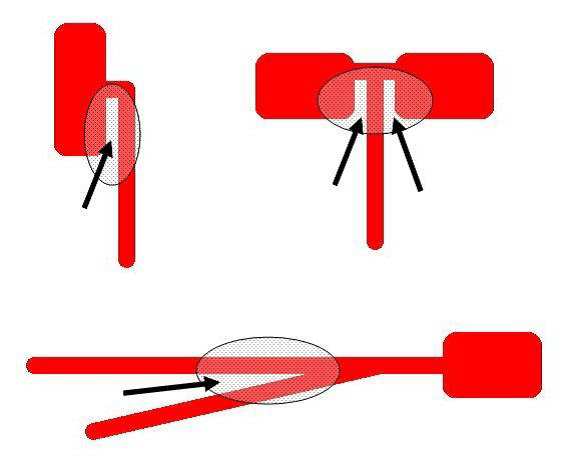 ONLY through hole vias can have Via Filling, so Blind vias can NOT have Via Filling. Important parameters are resin content, aspect ratio of the hole and the thickness of the core involved. A complete filling can’t be guaranteed. In our manufacturing processes we only use Via Filling as it has considerable advantages over Via Plugging. 1. Heatsink paste is a paste that consists of a special polymer which is filled with finely dispersed solid particles . The polymer can easily be applied to a surface using screen or stencil printing and becomes fixed and functional after a drying or baking process. The dispersed solid particles provide the thermal conductivity needed for the paste to act as a heatsink. Heatsink paste can be used to create printed heatsinks of various geometric shapes directly on a PCB as an alternative to metal-foil heatsinks or externally fixed heatsinks. 2. Always clearly indicate on which side of the PCB the heatsink paste is to be applied. This can be on one side or on both sides. 3. When generating output include the board outline in your heatsink paste layer(s). This is best done using a small line – e.g. 0.50mm (20mil) wide – where the center of the line is the exact board outline. We will remove this line from the production ready data. 5. The recommended end size of the heat vias is between 0.80mm (32mil) and 1.20mm (48mil). 6. The recommended coating thickness of the heatsink paste is 100µ (4mil) or 200µ (8mil). 7. Heatsink paste is NOT compatible with Immersion Ag or Immersion Sn as plating finish.